When you really think about it, teeth are pretty amazing. Granted, we’re “teeth enthusiasts,” so we’re a little biased. But, teeth are unique because there aren’t many other things in life that can (potentially) last for 100 years with just basic care and maintenance! So if you want your child to have a healthy smile that lasts their entire lives, it’s especially important to get them off on the right foot with their dental care. With a foundation of good brushing and flossing, plus these four tips from a children’s dentist in Gahanna, you can help your child achieve great oral health for life. Keep reading to learn more! It’s easy to think that the baby teeth are unimportant because they’re going to fall out, but in fact, it’s crucial to take great care of them for a couple of reasons. First, healthy baby teeth are vital so your child can chew, speak and smile normally. Second, baby teeth guide the development of the permanent teeth, so any problems with them can negatively affect the adult teeth down the road. We recommend that you bring your child in for their first visit with a children’s dentist at age three. In addition to discussing any concerns or questions about the baby teeth, we’ll use this appointment to make sure your child has a happy and positive first dental experience. We usually start by having a child sit in their parent’s lap while we look in their mouth. We may polish their teeth if they tolerate it easily, and we usually won’t do X-rays until they’re a bit older. Of course, most children’s favorite part is the end of the appointment when they can pick out a toothbrush and a toy! Fluoride is a mineral that prevents cavities. It strengthens the teeth the same way that calcium strengthens bones. Water supply or supplements – Many water supplies provide fluoride, but your dentist can prescribe supplements if your water supply doesn’t. This type of fluoride primarily strengthens the teeth that are still developing under the gums. Topical – This refers to the fluoride contained in toothpastes, mouthwashes and professional treatments at the dentist. Topical fluoride strengthens the teeth that are presently in the mouth. Dietary sugars cause acid production after eating that can dissolve the enamel and cause cavities. Although you don’t need to cut out sugars completely, certain high-sugar foods and beverages are best kept to a minimum. These include things like dried fruit, juice, sodas and candy. We know it’s important to you to get your children off to the right start with their dental health. With these four tips, you can! Dr. Joy Todd is a mother of two and a firm believer that a good foundation of oral health care in childhood leads to a healthy smile for life. 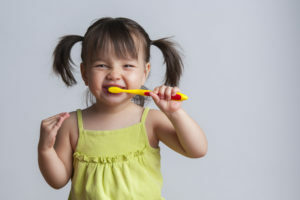 In addition to providing outstanding pediatric dental care, she also helps parents understand what to do at home to instill great habits from the start. If you have any questions, she can be reached via her website or at (614) 475-1874.